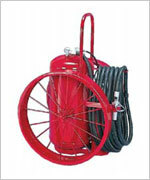 These commercial stored pressure extinguishers are available in a choice of two sizes and three chemical options. The carriage design on both sizes provides cage type protection for the agent cylinder as well as a well balanced platform for transportation and operation. The narrow width and easy rolling semi-pneumatic rubber tire wheels allow one person movement through narrow aisles, doorways and in confined areas. Chemical and pressure are sealed in the agent cylinder, ready for instant actuation and are always protected from contamination. 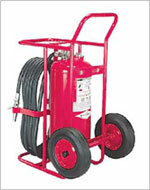 Stored pressure wheeled extinguishers are less expensive to purchase as well as easier and less costly to maintain and service. HIGH PERFORMANCE Stored Pressure units are the finest performing dry chemical wheeled fire extinguishers available anywhere! They have a tremendous flow rate, vertical and horizontal range, fire killing ability and operator protection. Wheels are wide footprint 36” X 6”. 125 lb. ABC & Purple K and 150 lb. 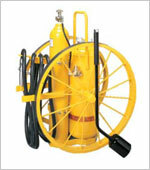 Regular Direct Pressure extinguishers utilize a 23 ft3 nitrogen cylinder with a “quick opening valve” to pressurize and completely discharge the agent cylinder. The compact size and 16” semi-pneumatic tires allow easy maneuvering and operation by one person, through narrow doorways and aisles. A 4” stainless steel fill opening with rugged brass cap makes servicing easier. For large hazards choose the 300 lb. ABC or Purple K or 350lb. 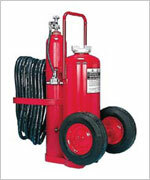 Regular Direct Pressure extinguishers with a “quick opening” 55 ft3 nitrogen cylinder. They provide quality and economical fire protection, large volume capacity for extra high hazard areas with single person transport and operation. 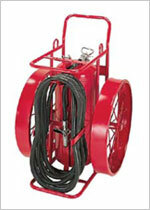 The 36” X 6” wide steel wheels make movement possible in sandy or soft soil. Exclusive features: Stainless steel collars, chrome plated brass cap, brass fittings, live swivels and bi-lingual labels. Meets Transport Canada requirements. These 110 ft3 nitrogen cylinder operated models feature a pressure regulator and two wheel options. The older, traditional design allows for adequate pressure to assure a smooth, complete discharge of the dry chemical with pressure reserve for blowing down the discharge hose. Choose either the 16” semi-pneumatic rubber tire or 36” X 2 1⁄2” steel wheels according to the area to be protected. Easy to transport and operate by one person. Exclusive features: Stainless steel collars, chrome plated brass cap, brass fittings, live swivels and bi-lingual labels. Meets Transport Canada requirements. The Model 630 contains a premixed FFFP (film forming fluoroprotein) alcohol resistant foam which is highly effective on Class B fuel fires and a penetrating and wetting agent on fires involving Class A materials. Excellent when used as a vapor suppressant on fuel spills to prevent ignition. Quality hardware throughout including the unique agent cylinder fabricated entirely of stainless steel – no interior coatings are necessary. Model 630 meets NFPA requirements for hospital helicopter pad protection. Two choices for large volume Class D (flammable metal) protection. Model 680 (Sodium Chloride) is effective on magnesium, sodium, potassium and sodium potassium alloy fires. 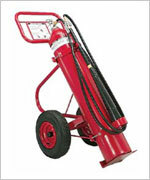 Model 681 (Copper Powder) designed particularly for fighting difficult lithium fires. Well balanced for quick transport on 36” non-sparking rubber tread steel wheels. Both are pressurized with Argon and regulated to a low 125 psi to avoid disrupting the burning materials. Large volume CO2 protection provided in either 50 or 100 lb. (2 – 50 lb. 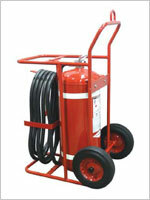 cylinders) government specification wheeled extinguishers. 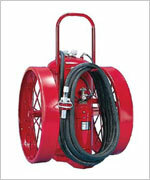 Rugged construction and easy to operate with a “quick opening” ‘T’ handle valve and horn mounted shut-off valve. A logical choice in areas where a Class B:C non contaminating agent is required and where hand portable extinguishers are not available.